In the world of kitchen design, considerable attention is often given to countertops, cabinets and appliances such as cooktops and refrigerators. It makes sense as these pieces often are the primary focal points when walking into a kitchen. Today, however, the sink is an fixture that has quietly come to the foreground. Traditionally, sinks have always been more about utility, but today it’s a different game. Manufacturers are turning to unique materials and designs that tap old and new aesthetics to offer style and color varieties that make sinks stand out as much as they stand up to daily use. “You’re definitely seeing it go from more of an afterthought to a statement piece,” said Daniella Villamil, an Art Institute-trained, Las Vegas-based, interior designer. Here’s a look at how today’s kitchen sinks continue to evolve with both style and function. Thanks in part to home-design television, the modern farmhouse has become a popular interior design strategy. Today’s consumer is enamored with spaces that are modern but give hints of traditional comfort with plenty of practicality. Farmhouse design has made its way to the kitchen, too, and especially the kitchen sink. “We have seen a farmhouse theme on the rise, people are looking beyond that clean white porcelain. … People are pushing for more interesting styles,” Villamil said. With its apron-front option, farmhouse sinks are primarily single-basin offerings, but you can find dual-basin ones too. They tend to be deep (usually 10 inches), and the simple, spacious single-basin square or rectangle designs make cleaning larger pots and pans easier. Farmhouse sinks add a traditional aesthetic that also folds in well with today’s clean straight lines. Italian sink designer and manufacturer Bocchi recently entered the U.S. market with its fireclay farmhouse kitchen sinks. 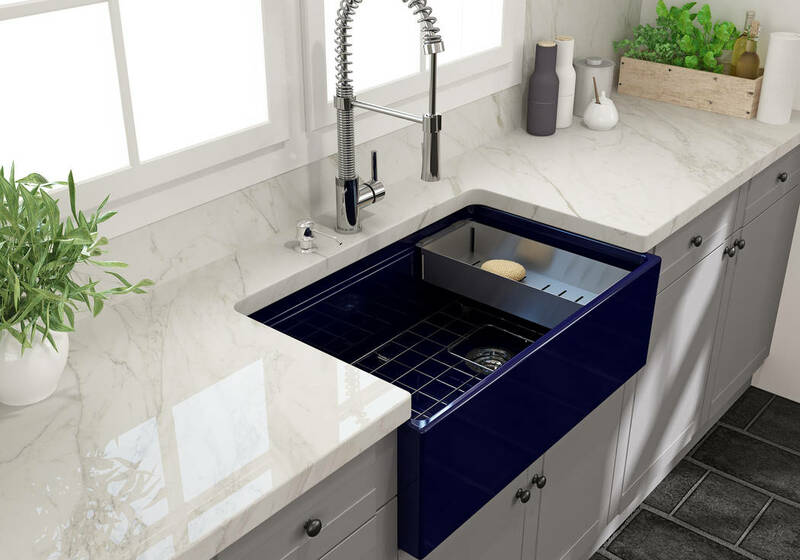 Available at Home Depot, the company builds rugged fireclay sinks ranging from 20 to 36 inches in size with diverse color options, including white, matte black, sapphire blue, matte brown and matte dark gray. The Bocchi fireclay sinks are naturally chip and stain resistant, according to Dawn Robinson, Bocchi USA’s marketing and communications manager. “It’s a beautiful piece that’s functional, stylistic, and you can choose to personalize it (with engravings),” she said. 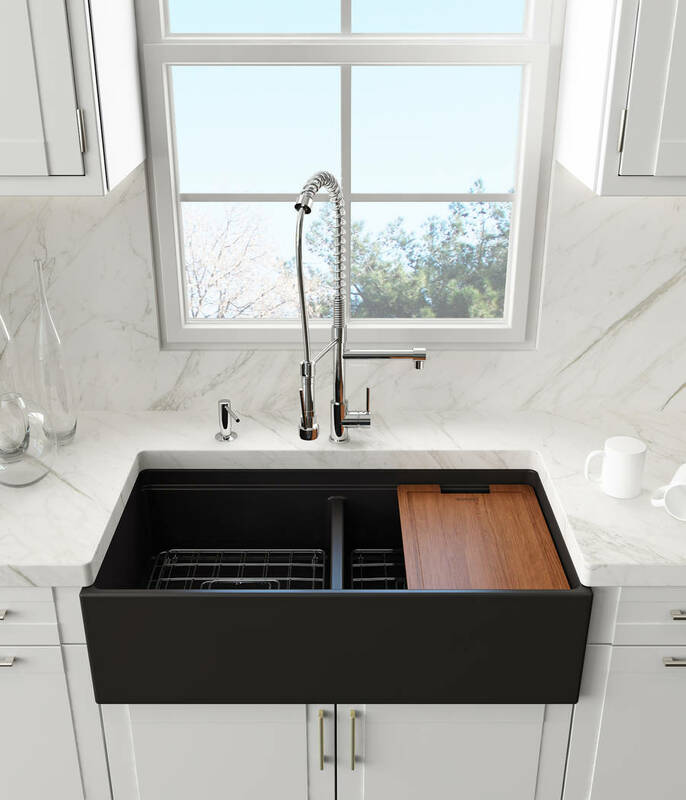 Kohler debuted its Farmstead sink in early 2018, which is a large 45-inch offering made of cast iron and can be installed as an undermount in cabinets. There also is a stand-alone option with two legs that looks like a piece of custom furniture. The Farmstead is unique as a top mount available in classic white or black. 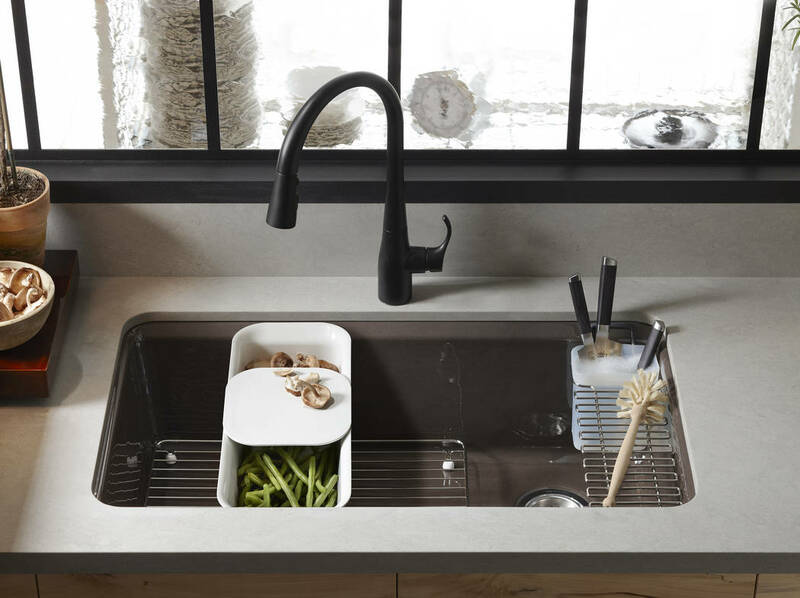 Kohler’s Whitehaven line of farmhouse sinks offer the popular apron-front style with considerable color flexibility, thanks to its iron construction. Sink color is a growing conversation between homeowners and designers, and not just for farmhouse styles. Villamil said today she gets more requests for copper and brushed aluminum, and matte dark colors like black and gray are very popular, too. “Matte black is the hottest color in 2019,” Robinson said. Kohler’s Cairn collection is built from a resin composite called Neoroc that comes in matte brown, taupe, gray, graphite and black. Villamil sees a trend away from all-white kitchens, in general, and toward darker countertops with charcoal gray and quartz. The darker stone counters are well-suited for farmhouse style sinks and other sink types made of materials that allow for color variety. Moore also said Kohler won’t be ditching its stainless-steel offerings anytime soon. Its Prolific line, which is a single-basin offering with a 10-inch depth, also has a three-tiered design to place accessories at various heights and sections. It comes with a bamboo cutting board, two grated racks, colander and wash bin. “You can create your own sink every time, depending on the occasion,” Moore added. Today’s sink manufacturers build units with accessories in mind. Robinson says the drive for accessories also ties into the need for more integrated workspaces in the home. 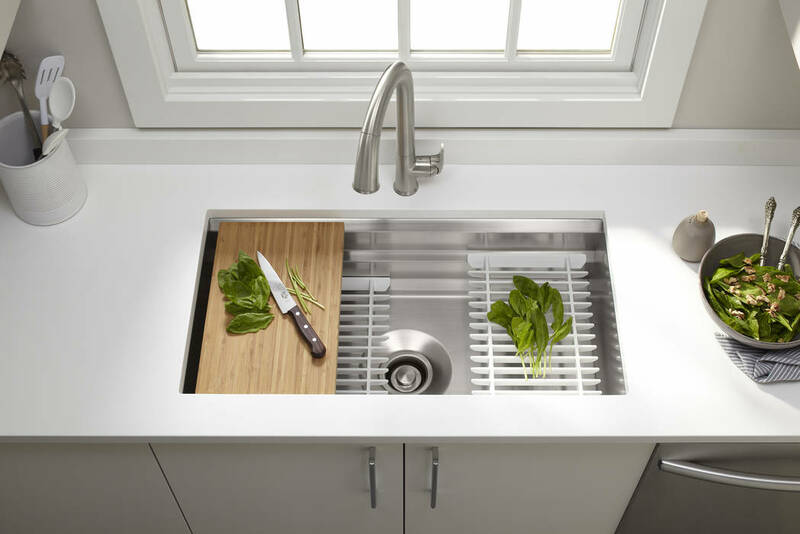 People are looking to get more function out of a sink, so colanders, cutting boards, basin racks that make cleanup easier are an expectation, not an add-on. Villamil is also seeing a trend away from double-basin sinks. Robinson sees a trend toward single-basin styles too, and Bocchi’s fireclay offerings are primarily single basins, which homeowners say make it easier to wash larger pots and pans. And even new parents like the spacious basins for washing a baby, Robinson said. While single basins are growing in popularity, Moore says some people still prefer a dual basin. “Some people do like that separation between the sink drain and the garbage disposal,” he added. While there are still some popular stainless-steel, top-mounted sinks — and Kohler’s unique top-mounted Farmstead model also has remained popular — the undermounted sink is still preferred and probably will be going forward. “It’s just a nicer aesthetic, and it’s easier to wipe things off the counter and right into the sink,” Moore said. Faucet innovation also goes hand in hand with sink selection. The single-control faucet has exploded in popularity in the past few years, with some preferring the semiprofessional models that have open coil designs. Touchless faucets are growing in popularity too, Moore said. Aesthetically, Robinson is seeing faucets in different colors, such as brushed nickel, matte black and oil-rubbed bronze. “It’s not all just chrome anymore,” she said.